Back in March, it was teased that The CW's new DC Comics TV series Legends of Tomorrow will be introducing a new character from the comics in the Season 1 finale. Just a few weeks later, it was revealed that Suits star Patrick J. Adams has come aboard to play this mysterious character, who was later rumored to be both Booster Gold and Green Lantern. As it turns out, both of those reports were wrong, with the season finale, which aired last night, revealing the actor as DC hero Hourman. 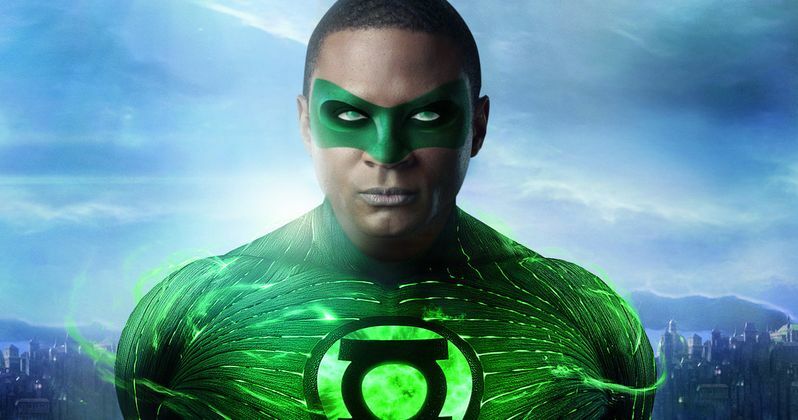 Just hours before the finale aired, though, executive producer Marc Guggenheim made it clear that there are no future plans for Green Lantern to appear in the DC TV universe. Shortly after the Booster Gold rumor surfaced in March, another report claimed Patrick J. Adams is playing Alan Scott, the Earth-2 version of Green Lantern, but those reports were never confirmed. As speculation continued to grow before last night's season finale, Marc Guggenheim debunked the Alan Scott rumor in an interview with Comic Book Resources, where he also said in no uncertain terms that Alan Scott, or any other version of Green Lantern, won't be appearing on the small screen. Here's what he had to say below. "I'll tell you right now, because I never want anyone to be disappointed, he's not Alan Scott. I love Alan Scott. I've written Alan Scott in the comics. Alan Scott is also attached to the Green Lantern franchise, which DC obviously has feature plans for. In the poll of 'who it's going to be,' you can cross off Alan Scott." It's not terribly surprising that this character won't be featured in the TV universe, since Warner Bros.' has already set a July 24, 2020 release date for Green Lantern Corps., which has been rumored to feature a number of Green Lantern characters. There has been talk that the movie could include Earth-bound Lantern's Hal Jordan, John Stewart and Kyle Rayner. A report from last month claimed that Warner Bros. is seeking an actor in his mid-40s to play Hal Jordan, such as 45-year-old Matt Damon, while the John Stewart and Kyle Rayner roles will go to younger actors. It's certainly possible that Alan Scott could be in the mix for Green Lantern Corps., but we don't know for sure. The project doesn't have a writer or director attached yet, but another report from last month claimed that the studio is eyeing George Miller (Max Max: Fury Road) to take the helm of Green Lantern Corps. Naturally, that report was never confirmed, but with just over four years left until this superhero adventure is slated to hit theaters, there is still plenty of time for the studio to assemble a cast and creative team. As for Patrick J. Adams' Hourman, the character is expected to return in a Season 2 arc. Stay tuned for more on Legends of Tomorrow, Green Lantern Corps and the rest of the DC universe on both the big and small screen.